It is all too easy to idealize the past, viewing it through rose-tinted lenses. The simpler days of yore are perfectly wonderful when you don’t have to cope with the plumbing of yore. I believe there is give and take in equal measure in how we’ve advanced and what we’ve lost between then and now. 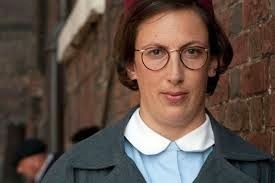 Call the Midwife is a good demonstration. 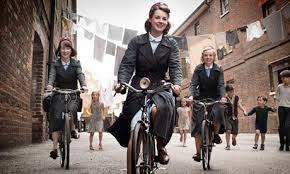 Yet another British hit that has taken the New World by storm, Call the Midwife provides my favourite way to learn history: through story. Rather than dry facts of dates and causes and effects, I prefer to peer through the window of time into what life was like for people. What work did they do, how did they bathe, what did they wear, how did they amuse themselves, what was the home like, what were the biggest challenges in their daily life? Though a dramatization, it is based on fact, being inspired by and based on the diaries of the main character, Jenny Lee. The focus is on the daily life of women, whether religious, single and working, or mother – on life, love, birth and death. While set in the past, it is recent enough that the world is still familiar to us in the present day. Our near relatives lived during the Post-War age and we know enough about it to be able to enter into the story as though it was our own experience. It takes place in what we think of as the last of the golden years. Despite the hardships of a recent war, we do rather idealize the 1950s. We know they’re about to enter the frenetic world of accessible global travel, crazy-fast advances in technology, sexual revolution, and the many other ways life was about to change. Some ways were for the better, yes, but we can look back on certain of their qualities (that tend to have to do with character and values) with fond regret. In the early years, the living conditions of the women cared for by the midwives are appalling. Truly appalling. The flats are dark and dingy. Washing is strung over the street, or in public hallways, lavatories are shared by all residents in the building, the smog is chokingly thick, the men could be brutal, and women laboured to deliver without pain relief. So many of the people are barely scraping out an existence, their poverty is painful to observe. The communal aspect of life means the midwives are aware of everyone in the district and their various needs. The doctor also knows them, visiting in their homes, and policemen walk their beat, knowing the neighbourhoods and what goes on there. Very few people are invisible. So we’ve gained miraculous advances in medicine and birthing theories, but no longer have a relationship with the person helping us deliver. We have the safety net of the hospital, but forgo the intimacy and comfort of home. Our homes are larger, possibly cleaner, no doubt warmer, but largely more isolated, with less community connection. We may be more sophisticated, but are also more jaded, having lost a lot of the simplicity and wonder of that time. Equally delightfully, they drink Horlicks at night, and have their tea from a cup and saucer. There’s something reassuringly calm about a cup and saucer, as you can hardly be rushing about clutching them in your hands; plus, if you have to prepare the tea and then clean up twice the dishes, you’re going to take the time to properly enjoy it! The show (being based on real life) doesn’t shy away from some very difficult subjects, but I think it always does so with sensitivity and with respect. For that reason I am comfortable in recommending it to our readers. 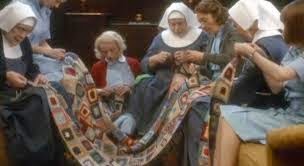 Watching Call the Midwife inspires me to be more reflective, observant, quiet, slower, more deliberate. 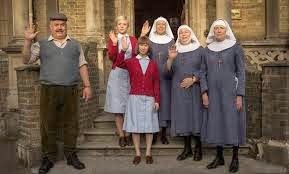 I think it’s a brilliant bit of television, and am very grateful that a wise executive discovered Jenny Worth’s diary, and that such a good team of craftsmen and actors have worked together to make it the beautiful production we can enjoy. I finally watched it last night for the first time and it was all I could do to press pause and go to bed. What a wonderful show. I find it interesting how both downton and this show have death positively with the issue of abortion. Neither, so far, has shied away from showing the terrible hurt and pain caused by abortion and the fact that these women really did believe that they were, shockingly!, carrying babies. I do hope that this show doesn't fall prey to the revisionist view of history and start writing scripts that project 21st century values onto the 1950s. I also hope that they don't use the show to promote the Margaret Sanger ideology that was born out of the revulsion for the circumstances in which these women found themselves. So far, beautiful show. I will make my father (born 1947 in Liverpool and with a terribly cricitical eye) watch and hear what he has to say. I'd like to know his opinion of it! From what I can tell CtM has been quite faithfully adapted for tv with very little, if any, revision for modern sensibilities.